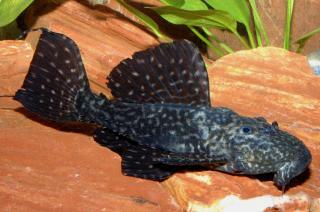 Pleco royalty for you this month as the world's most published l-number expert, Ingo Seidel, describes the first success in the captive breeding of a relatively new cactus pleco from Peru. 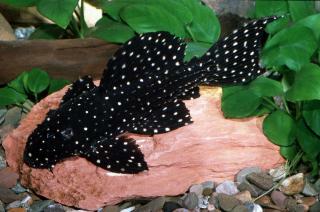 In recent years, the first attempts by various fish keepers at breeding armoured catfish of the genus Pseudacanthicus have been successful and have been published which has in turn increased the popularity of these so-called cactus catfish. However, there are still reservations surrounding these fish because of their size and the strong territoriality that goes with it. For some time I have wanted to try to dispel these views through clarification. Pseudacanthicus are no more aggressive than the very popular gold nugget plecos of the genus Baryancistrus and a few varieties remain even a little smaller than these Loricariids. 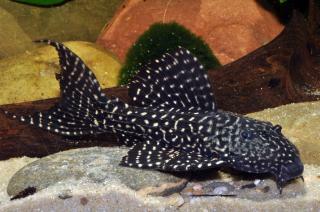 In the following article, I would like to introduce one of these, a relatively recent representative of the cactus catfish clan. 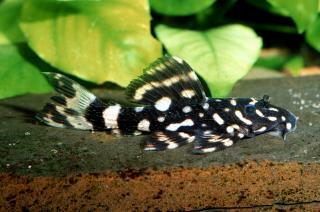 In the summer of 2010 I got a call from Oliver Frank (OF Aquaristik) from Butzbach, Germany, in which he informed me that he had just imported an attractive new cactus catfish with white markings from Peru. At first I couldn't believe it because up until then, the furthest west any members of the genus Pseudacanthicus were know was middle of the Amazon in Brazil. When a few days later I looked in at Oliver's new imports I was more than half surprised because without a doubt we were dealing with a new variety and a nice one too. A little later, an almost fully grown male and two smaller specimens which I hoped would turn out to be females were on their way to my home. 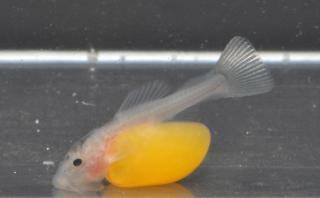 My hope was that eventually I would breed these lovely fish in my aquaria. 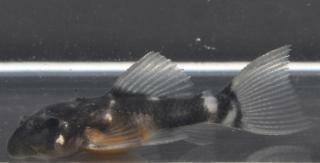 In fact, my first partial success in breeding these fish came sooner than I had dared to hope because only a few weeks later I was able to find an already sexually mature female of this variety at Gerhard and Patrick Gleissner's facility in Rednitzhembach. 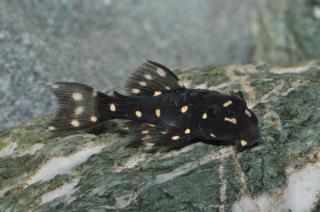 Their company, Amazon Aquatics, had at this time already managed to import this rare variety. So the ideal match for my male was found. The only problem was that this specimen was reserved for Sandor Tullmann. In a quick telephone call to Sandor I learned that he had only reserved the fish so that it didn't end up the only one of its kind in an aquarium. Since it didn't really go with the other fish in his tank anyway because it was large and they were significantly smaller, he gladly let me have it. So now I was the proud owner of a sexually mature pair and two younger specimens of this variety. 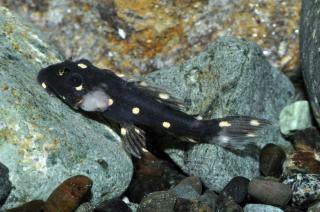 Without doubt the new cactus catfish from Peru falls into the Pseudacathicus fordii group. According to the exporters it comes from the Rio Tapiche, a tributary of the Rio Ucayali. The members of this group display very attractive white markings which are stronger when they are young and which with age lose a lot of their intensity and in some varieties (for example P. fordii itself) can even disappear completely. 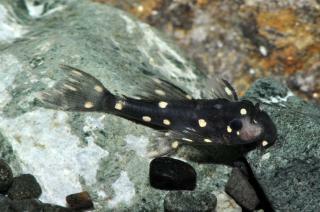 The fish in this group whose maximum size lies between 20 and 30 cm are the smallest known Pseudacanthicus. 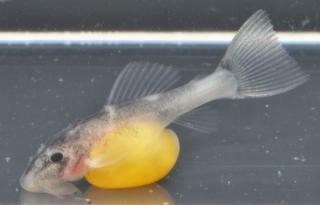 Breeding male L452 showing typical signs of mating "courtship"
Since then the Peruvian cactus catfish have, through Tullmann (2010), been given the provisional classification, L452. Since there are several thousands of miles lying between the place of origin of this fish and the place of origin of its ‘neighbouring' sister varieties L065 and L097, which come from major tributaries in the middle of the Amazon in Brazil, we might wonder whether perhaps one or two more new varieties of P. fordii may be discovered in west Brazil in the future. 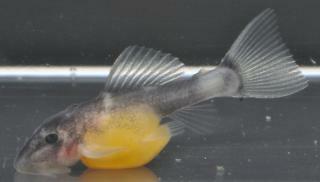 At home the two hopefully breeding fish which were 18 and 20 cm in length moved into an aquarium of 100x50x40 cm. 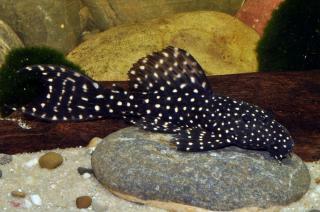 In my experience such a tank, which one or two of you might think is a bit small, is perfectly satisfactory for keeping and breeding a cactus catfish couples of this variety and size. In the end Pseudacanthicus are not keen swimmers and in a tank which is equipped with plenty of hiding places the fish can keep well out of each other's way. 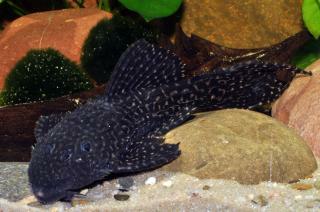 I keep my new Peruvian cactus catfish in such a tank as well as the Brazilian L65, mostly in pairs. 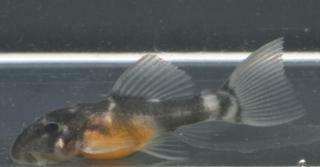 In the past, my L065 which reach almost the same size as the Peruvians have successfully produced young in such a tank on a regular basis over more than ten years. In my opinion, especially important for the successful care of Cactus fish is the provision of many hiding places, powerful filtration as well as the most frequent water changes possible. In the care of my Pseudacanthicus, I have built up stones and pieces of wood at the back of my tank between which the fish as well as their mainly smaller companion fish (I keep L452 together with Hypancistrus and Panaqolus) can hide. As a result my L452 have never inflicted any serious injury on each other although aggressive behaviour is quite normal in this species especially at mating time. My tanks of this size are filtered with foam blocks through which a pump draws the water at a rate of 1000 l/h as well as an air line. Through the addition of a airstone, an adequate sufficiency of oxygenated water is ensured. Once a week I carry out a 60-70% water change with coolish water. The water parameters fluctuate somewhat because of the ratio of my very hard mains water supply to filtered water but as a rule they lie between the following parameters: pH 6.5-7.5, conductivity 250-400, Temperature 29-30. My L452 were fed mostly with frozen food and tablets between which they don't seem to be particularly fussy. To feed these particularly carnivorous feeders, mosquito larvae, brine shrimp, water fleas and shrimps as well as mussels and fish meat are well suited. Before I put the female in with the male I removed the two smaller L452 from the tank. I provided the pair with three large breeding caves, closed at one end, of about 22-26 cm long and a cross-section of 6-8cm. Two of these were the usual clay tubes which even so I had to have specially made because of their size. Along with these though I gave my breeding pair a ceramic tree trunk of roughly the same size which I had brought from the USA a few years ago. My L065 always preferred one like this for spawning. And in fact the L452 also chose this as their spawn hole. About two weeks after I had brought the two fish together (it was November 2010), I could hardly believe my eyes. The male, it seemed, was sitting on a spawn which he was supplying with fresh water in the usual way with a fanning movement of his fins and which he regularly cleaned with his mouth. There were clear signs on the female of the usual Pseudacanthicus mating ritual in which mainly the male bites the female on the back and on the fins. But the now brooding male also bore clear signs of bite-marks. Apart from the usual water change, stimulation measures were apparently unnecessary with this variety. Otherwise more frequent and larger water changes and an increase of the flow of water are often effective stimulus. The egg clutch appeared to be enormous as correspondingly the extremely full abdomen of the female had been before. The yellowish eggs had a cross-section of about 3.5mm. After seven days using a torch, I could see under the cover the first hatched fry in the back area of the breeding hole. 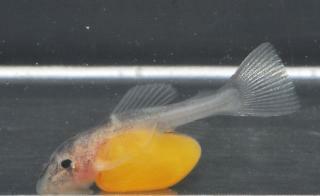 As with most young l-numbers, they still carried and enormous yolk sac. On the eleventh day I lifted the breeding cave together with the male and the young and carried them underwater into a tub. Now I carefully placed the tube on a slant and had to wait a good while until the fish calmly left the hole of his own will. It is not appropriate to rush this otherwise the extremely spiny adult fish can easily injure the young. After that I harvested - would you believe - about 140 young which I put in a large hanging container which I attached to a roomy and well filtered tank. While in the past I have succeeded in breeding Pseudacanthicus sp. (L065) mostly without loss I had great problems with the young L452. When I breed catfish I always put a layer of sand in the large hanging containers which are fed with water from the surrounding tank by an air pump and are also supplied with water through a foam mat. This sand should protect the young from a buildup of slime mold on the floor which they are very sensitive to. On top of that I arrange a few stones and pieces of wood as hiding places for the young. 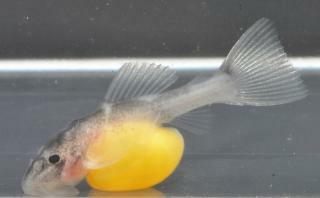 I usually feed young catfish on tablets, brine shrimp larvae and frozen Cyclops. I proceeded like this with the first brood, which initially seemed to be going well. The young L452 gradually grew and seemed to be thriving. They soon developed pretty yellowish markings. However, after a few months a few fish separated themselves and hung lethargically under the surface of the water. On closer inspection they showed patches mostly around their head and breast or the tail fin was fused and had a melted appearance. Only a few specimens reached a size of 4cm at which they seemed to be out of the woods and could be passed on. For the second brood I had to change something so that these losses did not happen again. In fact after about two months I was able remove about the same number of young from the breeding hole again. I put my failure down to feeding but just to be sure I put the young in a different tank with similar parameters. This time I fed them on a granulated feed which a fish breeding friend of mine had recommended and frozen Cyclops. For a long time that seemed to work but suddenly losses and the same symptoms appeared. Again, I was only able to raise a few fish in the end. Unfortunately the fish have not spawned again yet so I cannot inform you of the reason for my losses with certainty. However my experience with other varieties has given me clues as to what I may have done wrong. 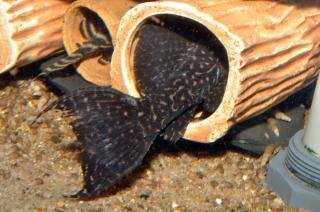 In raising young Ancistrus sp. (L071), which at present I reproduce in great numbers, I have experienced that fish of this genus which are kept at almost 30°C tend to suffer from this same problem. I had no problem at all with this phenomenon at 26°C. With my other L numbers which indeed come from water this warm in the wild, I have never had such a problem. This was the logical explanation to me and so I can hardly wait to start my next attempt at breeding. All I need is for my fish to do me the favour of reproducing again. Identification The pictured specimen was imported from Peru although very similar species are imported from the Rio Orinoco, Venezuela and the Rio Tocantins, Brazil. Although imported for several years beforehand, this species was given an L-number in 2010. General Remarks The pictured specimen was imported from Peru although similar species are imported from the Rio Orinoco, Venezuela and the Rio Tocantins, Brazil. With respect to coloration, this species closely resembles L097 and Pseudacanthicus sp. "Alenquer" from Brazil. They even share the same changes in coloration along maturation, but are easily told apart due to their differing body shape. Distribution South America: Ucayali drainage in Peru, Rio Tapiche close to Requena. Furniture A potentially large pleco that will need robust decoration in the tank. Fairly reclusive and will need cover to hide in. Care must be taken that no other inhabitants of the aquarium attempt to dispute ownership of this cover. This fish will fight for the territory and, with its array of spines and hooks, can cause serious damage. Suggested Tankmates The temptation with large tough Loricariids is to keep them with large, tough other fish such as Oscars or other brutish characters. This actually works quite well with most omnivorous or mainly vegetarian plecos. 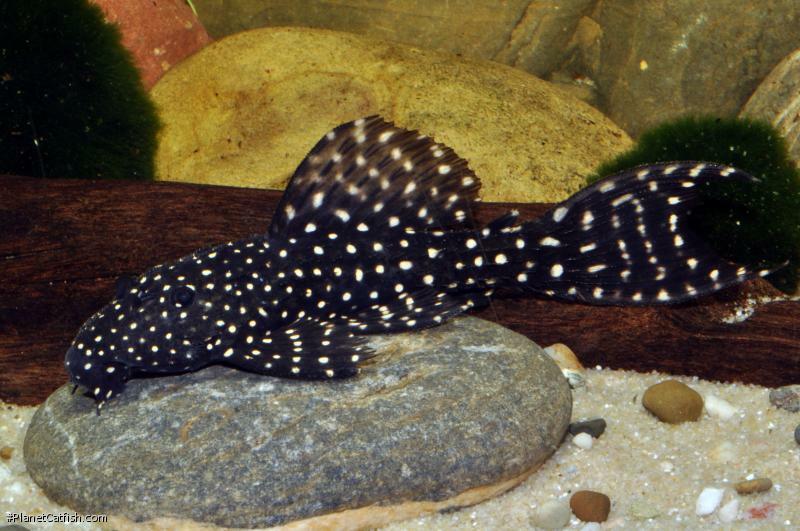 Pseudacanthicus however are big messy carnivores, but, like all large plecos, produce vast amounts of waste and as such would require monumental filtration to house alongside non-catfish ''equals''. It is better to think of these catfish as the centerpiece fish and stock their aquarium with medium sized (preferably omnivorous) fish.